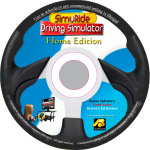 Aplusb Software can help you navigate the roundabouts and learn all the ins and outs of driving! For those not in the know, roundabouts are more or less just how they sound; they’re intersections that are round. Traffic flows through them without stopping, circling the a central circular median traveling counter clockwise; yielding to traffic traveling from the left, and slowing to speeds on average of around 15-20 mph, regardless of the set driving speed outside of the intersection. Studies have found that on the whole, roundabouts produce markedly fewer traffic accidents – and traffic related fatalities – than intersections with either stop signs or traffic lights. Because traffic only needs to yield, this also generally results in reduced congestion or “log-jamming” on approach to heavily traveled intersection; with no cost for maintenance or operation of electronic signaling equipment. The center median additionally creates for a space to beautify an otherwise unsightly traffic space. The key component to the safety and effectiveness of roundabouts is attentive driving; a core necessity for any road safety in general. Drivers must slow down upon entering a roundabout and be aware of the other drivers entering or exiting them; whether they’re on their right or left. Even though you must yield to the left, the driver to your right may neglect that crucial driving directive; and either because they failed to see you, misjudged the timing of your approach into the intersection, or because they thought they could cut in ahead of you, that car may still try to enter when they’re not supposed to, and you need to be alert and ready to respond in order to avoid an accident. Also be aware, when the roundabout has multiple lanes, which lane you need to be in, to go in the direction you’re headed. Generally if a roundabout has two lanes, vehicles in the inside lane must either go straight or turn left; turning right would intersect with the outside lane, which is for traffic turning right or going straight. Likewise vehicles in the outside lane can’t turn left, because it would intersect traffic in the inside lane, where traffic may be going straight. 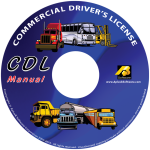 Oversized vehicles, such as semis or buses, are generally allowed to straddle both lanes to make the turns without issue; and roundabouts are also typically equipped with a cement “apron,” or outer perimeter that a trailer can ride along as a third lane, that’s raised enough to discourage use by smaller vehicles. 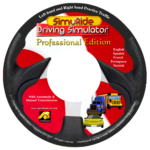 SimuRide Professional Edition, in addition to a selection of both small and oversized vehicles to practice with; includes an area in its driving course that features a roundabout that drivers can practice driving through. 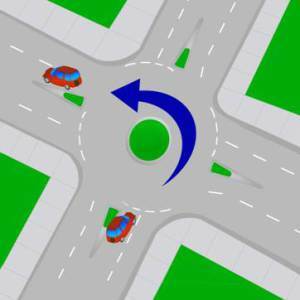 You can also learn about roundabouts as part of our Beginner Driver Education Curriculum program, available in our Online Store.